Amadeus’ latest flight search innovation, @flightbot, leverages artificial intelligence (AI), messaging technology and Amadeus’ search expertise to help travel agencies connect with travelers, anytime, anywhere via the messaging platform. Bangkok, Thailand - The use of mobile messaging has been on the rise amongst travelers, with six out of the top ten most used mobile apps being messaging apps. To cater to the ever-growing market demand and the digitally savvy traveler, Amadeus has developed an AI-powered bot in partnership with GoHero.ai (based in India). The bot connects LINE users with travel agents, using a messaging platform powered on GoHero’s AI and content through Amadeus’ search expertise. 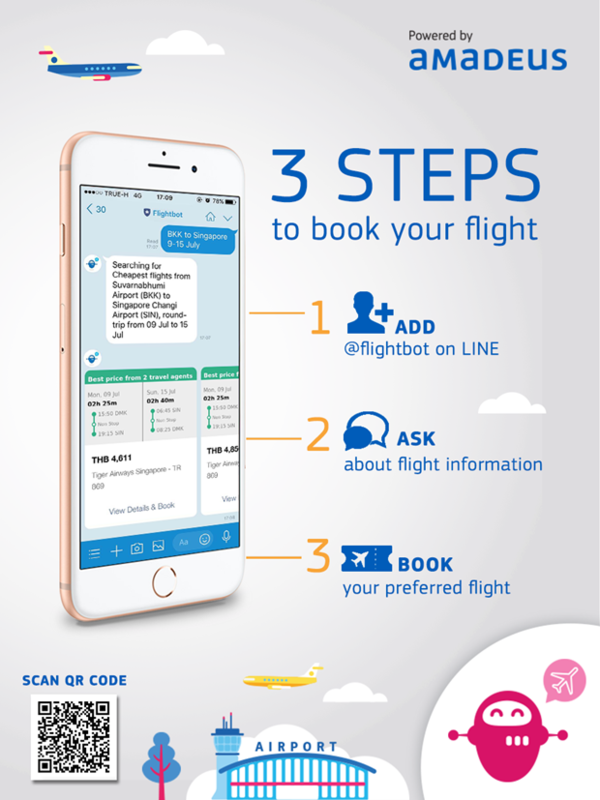 The bot, named @flightbot, will be initially piloted in Thailand, where Amadeus will be testing the bot with Thai travel agencies and travelers they serve before rolling it out in other markets across the Asia Pacific region. Designed to mimic human conversation, @flightbot is a user-friendly platform that helps travel agents keep up with travelers’ demands for information and options in real-time. Users on LINE can search for and befriend @flightbot via the messaging platform, chat privately with the bot and receive assistance for any flight-related queries. As a bot, @flightbot will be in constant learning mode and its capabilities will develop over time. Throughout the test period, the bot will address queries related to air travel bookings, departure city and destination, and flights with the best prices, in either English or Thai. The AI-powered service will also provide travel agents with a secure and streamlined transaction process, where travelers can complete payment via the @flightbot chat. Ultimately, thanks to artificial intelligence, @flightbot can become the perfect travel companion for travelers, providing round-the-clock conversational replies that can meet the personalized needs of travelers promptly and efficiently.